- Wal-Mart CEO: I'm not a big fan of marketing. Oops, I meant advertising. - It seems Microsoft might scoop up DoubleClick for a questionable $2 billion. - More contextual foolishness. 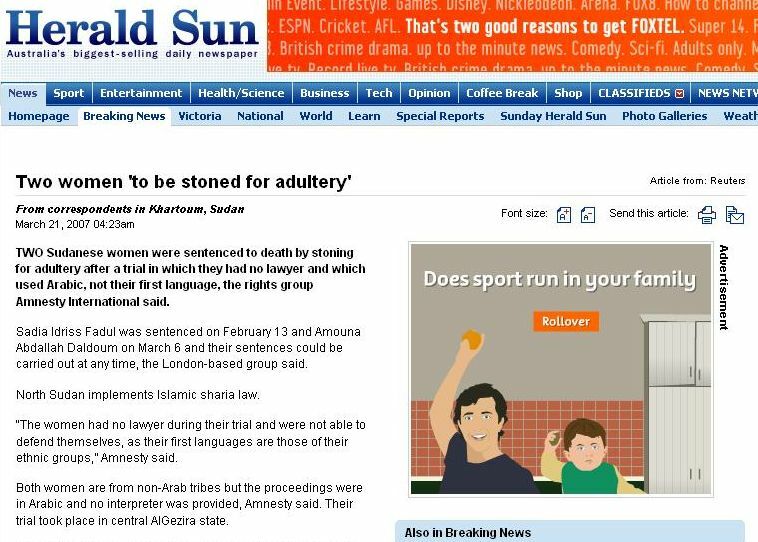 In a Herald Sun article about two Sudanese women getting stoned to death, an ad with a man and his son throwing stones appears. Don't you love the intelligence of computers? - Michael Eisner has hooked up with MySpace which will broadcast his online series Prom Queen beginning April 2. Eighty ninety-second episodes will be released. Check out the teaser here. - Musician Nathan Bennett has, in one day, written a song and created a video called On MySpace which thanks listeners for finding him on MySpace. He hopes to use it to promote himself.